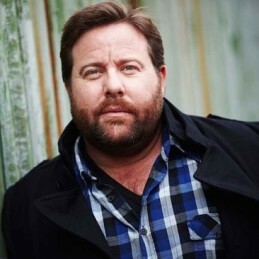 Shane Jacobson is one of Australia’s most loved award-winning actors, presenters and entertainers, having worked in radio, film, stage and television, and with some of the biggest names in the business for more than 25 years. Performing has always been an important part of Shane’s life. It all began for him at the age of 10 in amateur theatre, and it hasn’t stopped since. His gift for characterisation and quick witty tongue cemented his early success in stand-up and impersonating business identities at corporate functions. As Sergio, he was a regular on Melbourne’s Gold FM radio station in 1999, and it was around this time that Shane shifted his focus to acting, clocking up an impressive list of appearances in music videos, TV commercials and short films. He also worked as a TV audience warm-up performer for all the major Australian networks. It was his role as the title character Kenny in 2006 that brought him wide recognition both at home and internationally. He co-wrote the screenplay with his brother Clayton Jacobson, who also directed the film, and Shane won a string of awards, including the 2006 AFI Award for Best Actor, the Fim Critics Circle of Australia Award for Best Actor in a Leading Role, the 2007 Film Ink Award for Best Newcomer and Australian Star of the Year Award at the Australian International Movie Convention. Together Shane and Clayton also won the 2006 IF Awards for Best Feature Film and Best Script, and the Film Critics Circle of Australia Award for Best Original Screenplay. Kenny wasn’t just a critical success, it grossed almost $8 million at the Australian box office, making it the highest grossing Australian film in three years, and was the highest selling Australian DVD release ever. Following the success of Kenny, Channel 10 commissioned a nine-part TV series that travelled the globe, Kenny’s World in 2007. Subsequent feature film credits include Newcastle (2008), Cactus (2008) with and Bryan Brown, Charlie & Boots (2009) with Paul Hogan, the animated feature Santa?s Apprentice (2010) as the voice of Santa, Surviving Georgia (2011) with Pia Miranda and Holly Valance, and Hollywood blockbuster The Bourne Legacy (2012) with Jeremy Renner, Rachel Weisz and Edward Norton. Shane’s stage career has been just as successful. He featured in the 2008 revival of the musical Guys and Dolls alongside Lisa McCune, Ian Stenlake, Marina Prior, Garry McDonald and Magda Szubanski, and won a Helpmann Award for Best Male in a Supporting Role, playing Nicely Nicely. In 2010, he performed with Geoffrey Rush, Robyn Nevin and Rhonda Burchmore in The Drowsy Chaperone for the MTC, 8 The Play (2012) with Rachel Griffiths and Shane Warne, The Musical (2013) with Eddie Perfect and Lisa McCune. 2014 sees him taking on the role of Robert in the stage adaptation of Mother & Son, starring with Noeline Brown and Darren Gilshenan. Shane’s TV appearances have been numerous and varied, from hosting the 2010 Samsung Australian Film Institute Awards and co-hosting Top Gear Australia in 2010 and 2011 (which also saw him on tour with Jeremy Clarkson and James May in Top Gear Live Australia and Shane continues to tour with Top Gear Festival). In 2012, Shane starred in telemovie Beaconsfield as Brant Webb with Lachy Hulme and Cameron Daddo, the ABC telemovie, The Mystery of the Hansom Cab with John Waters, and their Jack Irish telemovie series Bad Debts and Black Tide alongside Guy Pearce, Marta Dusseldorp and Barry Humphries. He also put his sweet tooth to work in 2013 as a co-host for Channel 9’s The Great Australian Bake Off, featured in the ABC series It’s a Date, and starred as the musician and dad Luce in the 13-part series, The Time of Our Lives with Justine Clarke, Claudia Karvan, Stephen Curry and William McInnes.